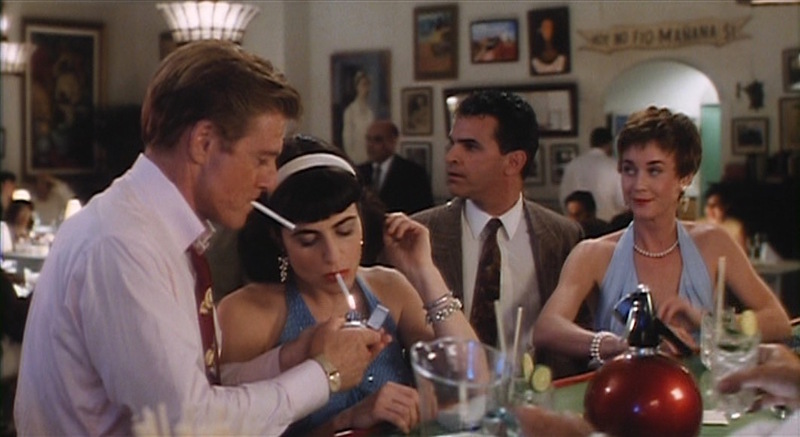 Blue is one of my favorite colors to wear for spring, and Robert Redford wore a bold turquoise blue suit for a memorable sequence in Havana shortly after Redford’s character Jack Weil arrives in the titular city. The time is December 1958, and anyone with any clue about Cuban history could tell you that that is a hell of a time to find yourself in Havana. Of course, our smooth hero doesn’t have a care in the world. He came down for a high-stakes poker game and the hopes of getting laid…hopes that were dashed after his traveling companion Roberta (Lena Olin) rejected his indecent proposal (see what I did there?) by mentioning her husband. Instead, Jack finds himself in the company of two vivacious American tourists, Diane (Betsy Brantley) and Patty (Lise Cutter), who are more than happy to follow his lead into some of the city’s nooks and crannies. Of course, the Casablanca-esque plot thickens when Jack again encounters Roberta and meets her husband, revolutionary leader Dr. Arturo Duran (Raúl Juliá). 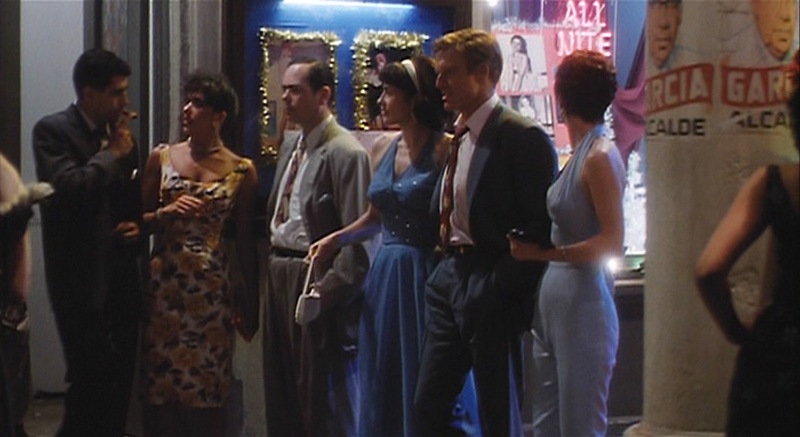 Jack Weil wears a sporty and bold turquoise blue gabardine suit for a night out in Havana, custom made for Robert Redofrd and provided by Western Costume Company of Hollywood. 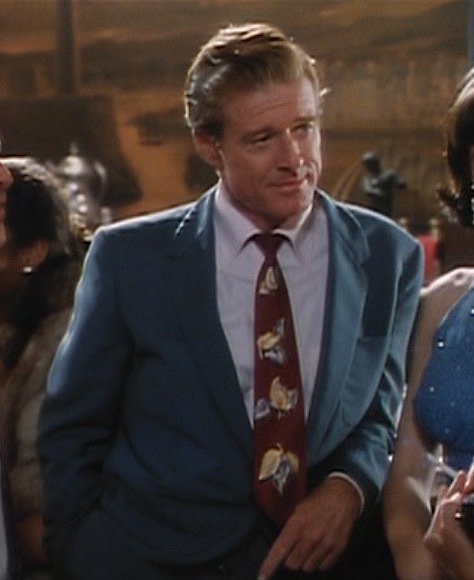 The single-breasted suit jacket nicely fits Redford with its era-appropriate full cut and padded, roped shoulders that also seem to be a personal preference for Redford’s on-screen tailoring. The narrow notch lapels roll down to the low two-button stance, so low that the tie often flops over the buttoned jacket. Both the buttons on the front and the two smaller buttons on each cuff are black urea. The ventless jacket has patch pockets on the hips and left breast. The trousers have belt loops, placed about a half-inch down from the top of the waist, where Weil wears a slim black leather belt with a small gold box-frame buckle. The single reverse pleats are placed at the first belt loop out from each side of the fly. The trousers have side pockets, jetted back pockets, and are finished with cuffed bottoms. Jack Weil’s walk of pride as he escorts Diane and Patty through the streets of Havana before finding their way back to the cozy confines of his hotel room. 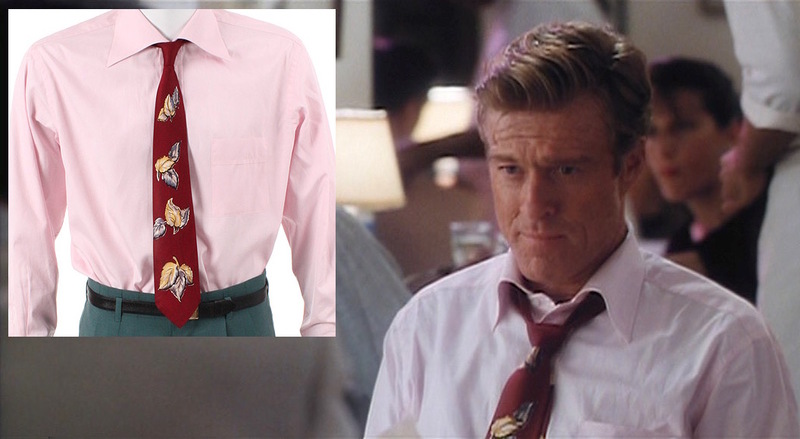 Redford’s pale pink cotton long-sleeve dress shirt was created by Anto Beverly Hills (with a “Nat Wise of London” label) with a large and distinctively shaped spread collar. The shirt has a front placket, breast pocket, and single-button barrel cuffs. LiveAuctioneers featured one of the shirts worn by Redford on screen, sold for $300 in June 2013. 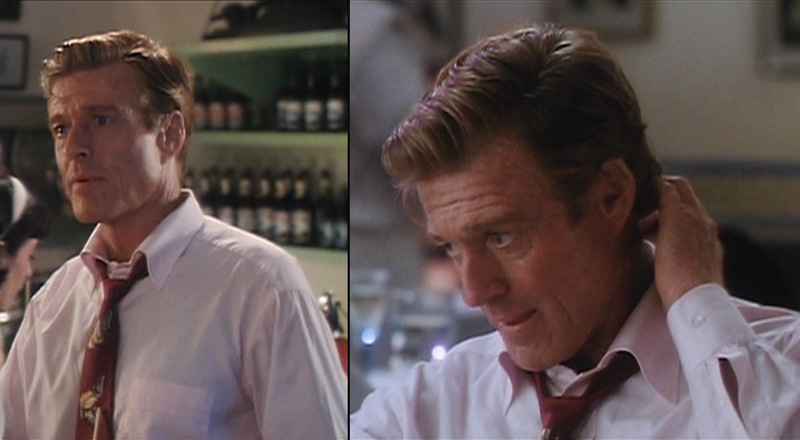 Redford’s proved many times that real men wear pink…and his romp with Patty and Diane later that evening should certainly prove that the boldness of wearing a traditionally “non-masculine” color will go a long way toward impressing women. Weil’s burgundy silk tie is painted with a large yellow-and-blue gray leaf motif, repeating four times between the knot and the wide blade. 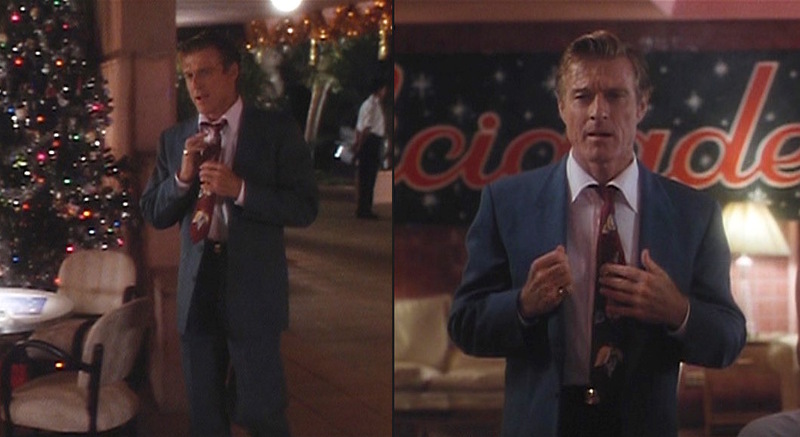 The tie may be the most dated element of Jack’s ensemble. Weil dresses for his night out by wearing the snappy black-and-white leather spectator shoes that introduced his character in the opening scene. The two-tone oxford brogues have a black perforated wingtip toe cap, black outside counter on the heel, black eyelet tabs, and black laces with a white vamp and quarter. As he did with their first appearance, Weil appears to wear his black-and-white shoes with black socks. Spectator shoes add a nice pop that make an outfit more interesting and, in this case, dial down the formality to keep Jack Weil looking snappy for an evening out on the town. Redford swaps out his usual silver ring for an ornate gold signet ring, worn on his right pinky. The pinky ring better fits Weil’s gambler persona and likely would have clashed with Redford’s silver ring, received as a gift from Hopi Indians in 1966 and worn in most of his films since then. Weil wears an all-yellow gold watch, strapped to his right wrist on a flat gold bracelet. Jack lights up with his new friends. 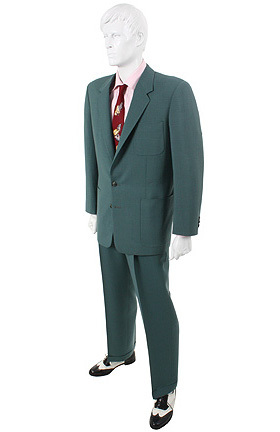 This entire screen-worn outfit – from the suit and shirt to the tie and shoes – is offered at The Golden Closet for $2,500, as of March 2017. 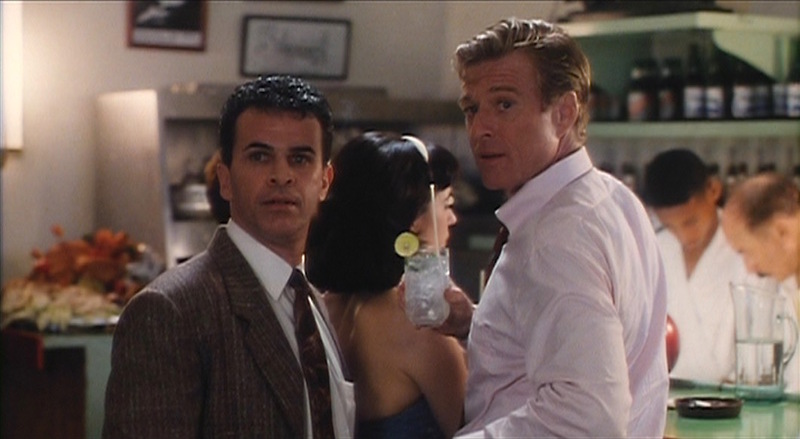 Jack Weil and his reporter pal Julio Ramos (Tony Plana) begin the evening at “Hemingway’s favorite bar,” according to Julio, and appropriately commemorate the occasion with one of Papa’s preferred cocktails: a classic daiquiri. After making the acquaintance of Diane and Patty, Jack asks the two young women if they “want to try anything” (oh, geez) before picking up a round of mojitos for the group. I’d also avoid eye contact with any bartender after ordering a mojito. Jack is wise to suggest this cocktail for the group, particularly in their “when in Havana…” mindset. The mojito was also reportedly a favorite drink of Ernest Hemingway, particularly when imbibing at La Bodeguita del Medio in Havana, and Pierce Brosnan’s James Bond would also enjoy one while kicking back on a warm Cuban afternoon in Die Another Day. Start by muddling the mint with the lime juice and sugar in a Collins glass, then add a splash of soda water and fill the glass with crushed or cracked ice. Pour in the rum – preferably Cuban rum, of course – and top off the whole concoction with soda water and a final mint sprig for garnish. For an extra taste of Havana, cut the sweetness with a dash or two of Angostura bitters and enjoy on a warm summer evening. Beware… Jeffrey Morgenthaler wisely warns against downing ten mojitos in one sitting, as tempting as it may sound. For more mojito-drinking tips, check out Morgenthaler’s The Dos and Don’ts of Mojitos. 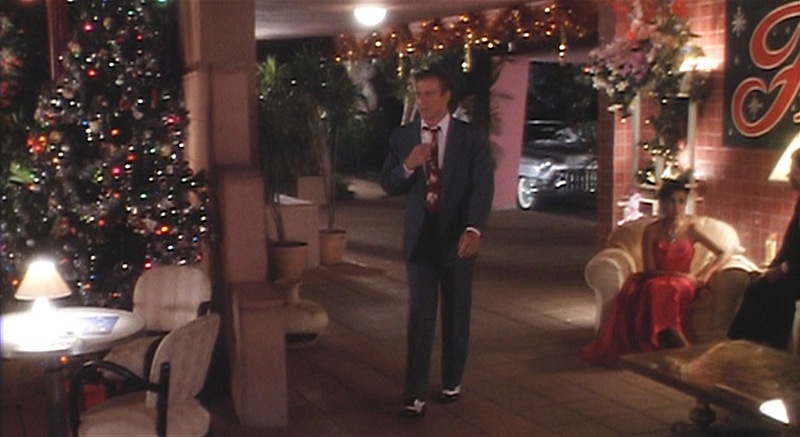 Redford’s suit from Havana, as featured at The Golden Closet. Jack Weil’s costumes in Havana perfectly illustrate an eye for costume…this is exactly the outfit I would expect to see a confident gambler wearing for a tropical night of bar-hopping in the late 1950s.